Friday 13th May 2005 marked a special occasion in Prisoner and Portmeirion history, as a plaque commemorating the series' filming at the North Wales location was unveiled above the Prisoner Shop doorway. 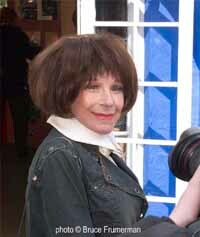 The plaque, organised by the Wales Screen Commission, was unveiled by Fenella Fielding - best known to Prisoner fans as the Voice of the cheery Village announcer in the series - in front of a gathering of fans, journalists, and film crews. For a special report on the event, including some exclusive images of the occasion, and the plaque itself, click HERE.